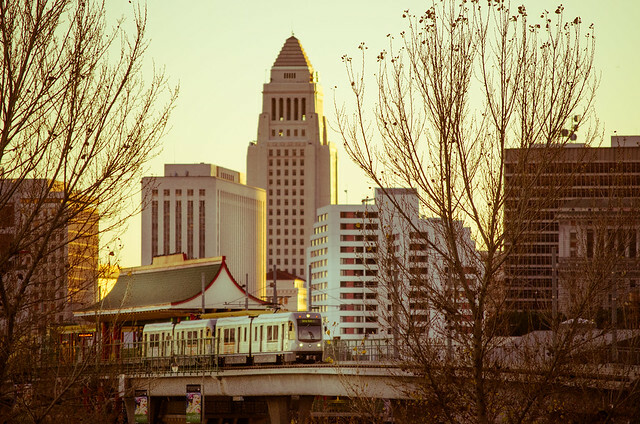 ART OF TRANSIT: A northbound Gold Line train leaving the Chinatown station last week at sunset. Photo by Steve Hymon/Metro. Rep. Adam Schiff urges local officials to vote to keep Glendale Ara Najarian on the Metro Board of Directors. Najarian’s vote to put Measure J on the ballot and opposition to a tunnel to close the 710 gap has raised opposition to him serving another term on the Board. A small apartment and condo complex near the Highland Park Gold Line station is to be discussed by the Highland Park Neighborhood Council. It’s been in the works for five years and features about 80 units to built atop city parking lots behind businesses on Figueroa Street. Seems like a great place to build — it’s literally a 12-minute ride on the Gold Line to Union Station — and having more residents in the area would help merchants on Figueroa. But it sounds like Highland Park is taking the same route as South Pasadena and minimizing the number of people living near its central business district and transit. Hmmm.